One of the first important steps toward becoming a responsible adult is obtaining a driver's license. Your child has finally reached that age, or is nearing it. What do you do to prepare for this momentous occasion? Professional Teachers ... Experienced Instruction ... Always The Best Price! 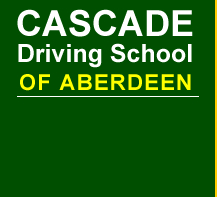 Cascade Driving School is "The Best in Driver Education" in the Aberdeen, Washington area. We offer classes for teenage and adult drivers. Please browse our web site to see what services we can offer you! We even offer limited pickup services for local adult students (drive appointments only). We are always happy to answer any of your questions by phone or e-mail. We are based in Aberdeen and periodically offer branch schools throughout Grays Harbor, Jefferson, and Pacific counties. We price match any local commercial school. * All information and prices are subject to change. Please call to verify.